These are the shy, wild creatures from which were derived the domesticated ferrets. Polecats are seen, albeit only very occasionally, in many parts of Britain including West Wales. They can grow up to 65 cm long, including a tail of up to 19 cm, and their typical lifespan is five years. 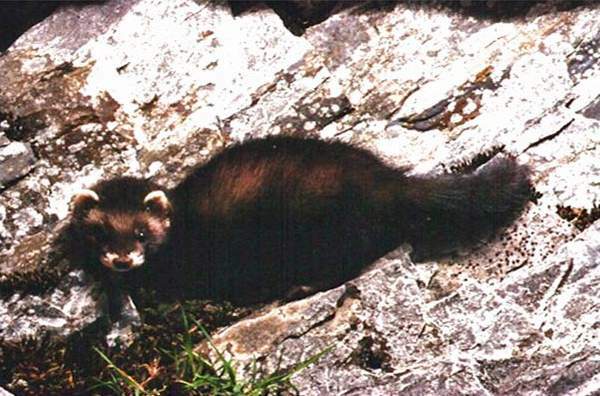 The polecat is a strong swimmer and quite capable of catching fish to eat; however its diet consists mainly of small mammals, reptiles and any birds. Poultry farmers used to be seriously troubled with predation by polecats, but now polecat numbers are so few that they are generally of little concern to farmers. This page includes a picture kindly contributed by Melvin Grey.